LANDSCAPE - International B&B ® is a nice and cozy place for travelers visiting our wonder city! Located in a safe area, close to city center and Sopocachi Bohemian area, just 10 minutes’ walk from the yellow cable car station, and 5 minutes’ walk from the Main Avenue. We offer the feeling of a home for solo travellers, couples and groups. We have a nice kitchen and living area where you can work, chill or meeting new people. Our place is a really good base if you plan to stay longer, usually people book for one night and stay longer periods of time. We are very much looking forward to have you at your new home at La Paz! 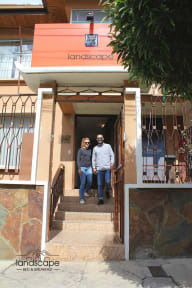 LANDSCAPE - International B&B ® is located at the bohemian Sopocachi, residencial area of the center of La Paz, which is just a 5-minute walk away from the belly button of the city, conectingthe center, Sopocachi and Central Park. The property is a 5 minute car ride from the Cable Car Yellow Line and a 15-minute drive from the Bus Terminal. El Alto International Airport is 30 minute away by car. LANDSCAPE - International B&Bl ® offers comfortable budget double and triple private rooms and dorms. 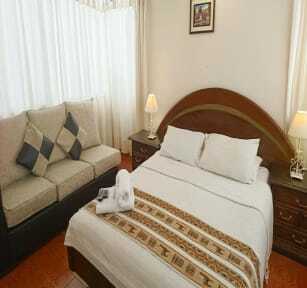 We offer private rooms provided with large and comfortable beds, flat TV with cable channels, wooden or carpeted floors. We also offer dorms, with 4, 6 and 8 spots only. Some rooms display ensuite bathrooms. Check-in time starts at 12 am. Breakfast is included as a courtesy in the room rate.